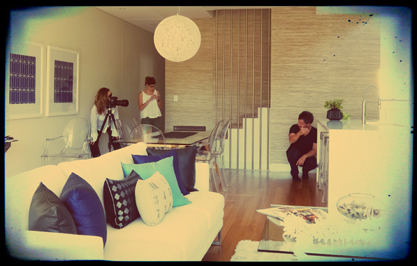 Some of the Alexandra Kidd Design team headed down to Coogee this morning for a photoshoot. The property we were shooting began it's journey as a sad, run down, one-storey house, and now, a year later, it is an amazing four bedroom family home with a huge open plan living-dining area. The new rear decked terrace opens out onto the garden for those summer bbqs and light nights. Alex and her team worked closely with the architect and building contractors to produce this fantastic stylish abode. The contemporary finishes and the plentiful natural lighting makes this property a dream to photograph. This property is the ultimate example of the type of transformation Alexandra Kidd Design can bring... from dingy to designer ... from drab to fab!